Since 1985, America has celebrated July as the nation’s official Park and Recreation Month. July is a great time to highlight all the many valuable benefits Parks and Recreation brings to your neighborhood – from health and wellness to nature to community spirit and social equity. 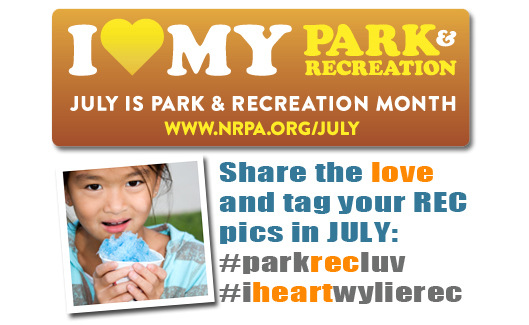 This July, we want everyone talking about what they love about parks and recreation and why parks and recreation are so vital in our lives! Check out more than 60 extra reasons to “HEART” Wylie Parks and Recreation during the month of July. Check out the wide variety of July-only activities we have added for this special month. Most activities are FREE unless otherwise indicated. All month long, tag your pics with us! Check out our flyer, or browse below. A little taste of Austin – the hottest trend in food right here in Wylie! F 7/12 w/ "The Lorax"
BIG FOOT TRACKS FOUND IN WYLIE! WE ARE BRINGING THE REC TO A PARK NEAR YOU. Staff-led camp style games and activities for 3 days in 3 parks. Locations posted on Instagram, Facebook and Twitter each morning. Attend all 3 mobs and win a prize! GIVE A LITTLE OF YOURSELF! Live music, professional hula dancers, limbo contests, games and instructional hula dance. Free event, bring money for food truck. Fun, food and friends! Includes live Hula Dance performance. How low can you go? Challenge your friends in this traditional party game for prizes! Round and round it goes. When it stops ... you are OUT! Contest for fun and prizes. Classic summer game with a 36” ball! We’ll drive. Relax and have fun! Ages 17 and under must be accompanied by an adult, age 18 and older. Register per person by 6/28 at the Center or online. Bring car seat if needed. Beat the heat in our front yard! Vertical Rush Slip N Slide and Tropical Jump and Slide. Waiver required prior to participation. Bocce has gone coco-nutty in this fun summer game! Can you knock down pineapple pins with a coconut? Play with your food! Greatest distance wins! Enjoy this classic summer game. Race to the top of the 26’ coconut trees. Shake that grass skirt and limbo! Learn about the Hawaiian traditions and cultural activities. Sample the tropical sounds, sights and tastes of the magical islands. Preregistration by 7/2 and parent participation required. Register per child at the Center or online. Includes parent. Showing ‘The Lorax’ on the lawn! Bring something to sit on and money for food truck concessions. Introduction and instruction for this popular outdoor game. Register by 7/5 at the Center or online. Learn about adding a garden to your compact urban landscape. Container to raised beds, everyone has room for a little green. Register by 7/3 at the Center or online. Learn about composting that focuses on the science of the use of worms to compost kitchen and other organic waste. Register by 7/3 at the Center or online. Founded in 1979, this 100 acre orchard lies just east of Terrell. Ham Orchards consists of 5 orchards containing approximately 6,000 trees. Register per person by 7/10 at the Center or online. will gather there for certain, because today's the day the teddy bears have their picnic.” We are bringing the popular words to life at this one-of-a-kind event. Bring your bears and a picnic lunch for a story, crafts, a bear movie and lots of fun! Preregistration by 7/5 and parent participation required. Register per child at the Center or online. Includes parent. The ‘90s called. They want their Hacky Sac back! Grab your rasta hat and compete for prizes. Learn easy steps for selecting and caring for native Texas and drought tolerant plantings. Blacklight 80s Theme. Admission – ZOMBIES, ONLY! Bring money for concessions. Register by 7/17 at the Center or online. Learn easy to recall techniques for a variety of ability levels! Walk for cake, cookies and other treats! Dress up encouraged and applauded. Get it and go! Whether you find yourself in the aftermath of a tornado or zombie invasion, be prepared to head for the hills. Learn what must-haves every Bug Out Bag should have. “Does whatever a spider can!” Introduce your little ones to the climbing wall while learning about safety and proper technique. Register by 7/12 at the Center or online. By popular demand this competition style inflatable is back! Learn easy to recall techniques for a variety of ability levels! Register by 7/12 at the Center or online. Learn to prepare a variety of meals in the wild with safety in mind. Register by 7/12 at the Center or online. Learn to use a compound or recurve bow. Curriculum designed for a variety of skill and ability levels. Register by 7/17 at the Center or online. Learn how to tackle minor to medium impact injuries that occur away from the convenience of an urban setting. Register by 7/15 at the Center or online. Battle your friends in the awesome inflatable experience. Mad Science - Family Lab Night - Bubbles, Potions & Slime, Oh My! Enjoy this very popular crew’s take on science, performance and audience participation. Enjoy Clue, Guess Who and more with family and friends. Test your forensic skills with the Wylie Police Department. Walk through a mock crime scene looking for clues and try to solve the crime!